What type of material is on the sole of the cuff? It looks like the cooling does not happen down there and that it is a flat surface. Is this correct? There is no cooling on the sole of the Aircast Ankle Cryo Cuff. The cold water fills the side off the cuff. Does the compression come simply via gravity, or is there a hand pump involved? can I purchase only the ankle cuff? I just had a bunionectomy on my left foot on May 4, 2015 and then two in a half weeks later I had to have surgery again to remove the screw that the doctor put in my big toe joint bone because it was causing a bone infection. Now my foot stays swollen and extremely painful. My doctor says it is going to take possibly a year or more for the bone to fully heal. Can you use hot water for a warm compression in the cooler or does it only work with cold water? What are the measurements for the Ankle Cryo/Cuff pediatric size? It is 8" X 7"
WILL THIS HELP AN ANKLE BROKEN 7 YEARS AGO? I HAVE PINS SCREWS AND A ROD. ON OCCASION I HAVE PAIN. The Cryocuff will provide cold therapy which can help with pain. Does coverage include the bottom and back of the heal area? Does a good job of cooling. Pros: Easy to use. The foot cuff can be detached so you can have more freedom of movement. I had foot surgery. Cons: Pricey. Instructions could be better. For example, I had no idea what the aluminum pad was for. Had to watch a YouTube video to fine out that it goes on top of ice. I would prefer a better fit and I would like the cuff to get colder longer. The coolness last about 15 mins. You need to purchase a lot of ice. I was doing 20 mins ice/1 hour off. 40 lbs of ice lasted about 2.5 days. Makes the task of placing ice on my ankle to reduce swelling easier. The boot is very comfortable and allows me to ice the swollen area for longer periods. I can also place it on both ankles, even though I purchased it to place on the one that was swollen. I use this product 20 minuets out of every hour to keep the swelling down in my ankle, it is so much easier then using a ice pack. I would recommend this product to anyone who has an ankle injury. I have the non motorized type it was cheaper then the motorized and works great. Pros: Fast, easy, ice stays frozen for a long time. The compression is great. I also have one for my knees and they are just a wonderful product. Cons: Can not think of anything bad about this product. I bought this for any type of foot or ankle swelling and it is really a great product. I wished so h ad this when I tore all the ligament in my foot. I used it for another reason and the swelling is gone. I have had this for about 8 months. Cons: A little bit of work to get all the water out of the foot section. Instructions could be clearly written. A little bit bigger writing for someone of my age. Much better than ice packs! The ice and compression work well together. Pros: The steady state of cooling provides significant relief from swelling and pain. Cons: It requires more ice than expected. My refrigerator ice maker could not keep up with daily use. I used it while recovering from surgery. This was recommended to me by my foot surgeon for post surgery. I used it consistently the first several days and found it really helped reduce swelling and made me more comfortable. Two weeks post surgery and still using it 4-5 times a day. The cooling reduces pain and feels good! Better than simply ice on it as that isn't comfortable and is hard to keep in place. 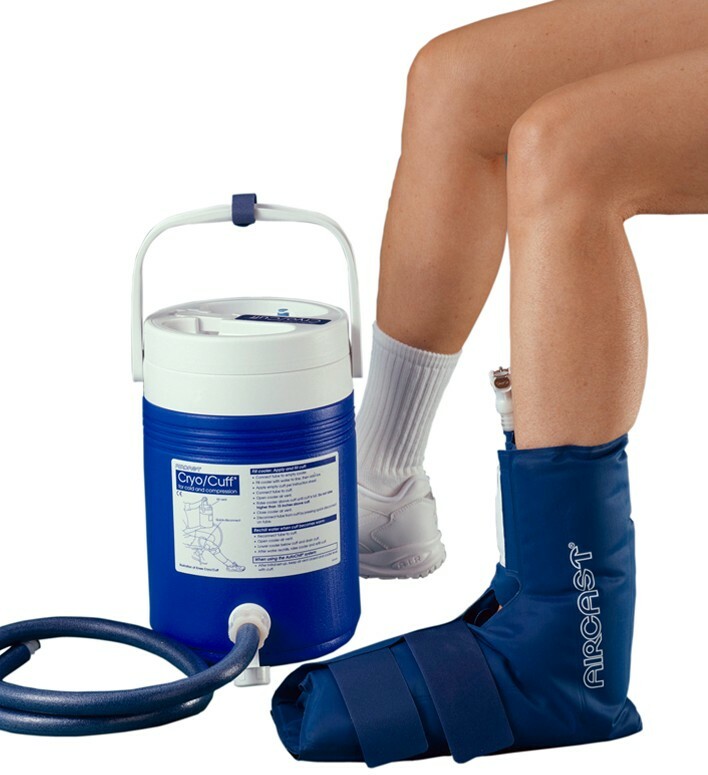 This boot is easy to use, empty and refill immediately with ice water from the cooler. I've told several friends about it. Easy to use and helpful but not sure if it was worth the $$$. I used it after ankle replacement surgery for help with swelling and post PT comfort. The "Game Ready" was a lot more effective but at $2500 or $125/week rent I don't feel the difference is warranted the cost.